It’s a powerful thing, knowing why you are here. Or at least possessing some strong notion about what your purpose in life might happen to be. Reflecting on my entry to middle life at the dawn of a new year, it would seem that my job on this earth, so far as I can tell, is to learn all sorts of things and then spread that knowledge to as many other people as I can. My job, cosmically speaking, is to teach. Knowing this gives me direction and comfort. It is an anchor when I feel otherwise adrift. I’ve wanted to teach for as long as I can remember, and have been lucky enough over the years to fulfill that goal in various ways. I’ve taught college students, coached athletes, spread knowledge as a newspaper reporter and now as a writer about food and the natural world. This blog was born of that urge, as was my book. Of all the ways I can share information, however, nothing is so gratifying as is teaching face-to-face. Last weekend I got the chance to do that twice. Two things I do intimidate outsiders above all others: Hunting, and foraging for mushrooms. Hunting involves firearms, a culture alien to many, unfamiliar equipment and — let’s face it — the death of an animal. Mushrooming, on the other hand, can lead to your own death if you are not careful. Neither pursuit is to be taken lightly. My friend Stephanie had wanted to look for mushrooms for a long time, but our schedules did not mesh until New Year’s Eve, when I took her and her friend Ben to Point Reyes in search of, well, whatever we could find. Let me start by saying I am by no means a world-class mushroom expert. Lots of people know more about our mycelial friends than I do. But I can identify a dozen or so edible mushrooms, and those I don’t recognize I bring home to study. I was hoping to show Stephanie and Ben some edible mushrooms, which is best done where they live — you want not only to recognize the unique characteristics of the mushroom itself, but also to understand the environment where it lives. So I took them to a spot where I’d picked salal and huckleberries last summer because I know that edible hedgehog mushrooms associate with these bushes. This was the first mushroom we found. It ain’t a hedgehog, it’s an amanita, probably amanita aspera. Definitely not an eater! 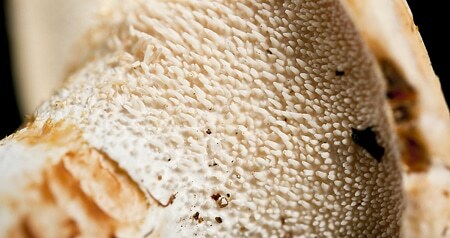 Cool-looking, though, and as I learn more about mushrooms I am appreciating the beauty of the inedible species more. Stephanie asked how I knew this was an amanita. 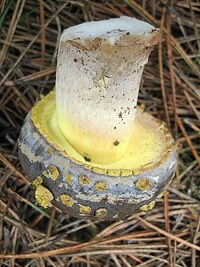 For starters, the mushroom was coming up from a cup under the soil, a tell-tale sign of an amanita. Second, look at those warts on the cap — they are another indicator. Finally, I remembered seeing mushrooms like this in my guidebooks, so I had a visual image to recall. Lesson: Study the pictures in your books, and it may trigger something in your mind that will help you positively ID the mushroom later. A few yards from the amanita was a patch of yerba buena, a kind of native mint that grows on the California coast; it is what is pictured at the top of this post. 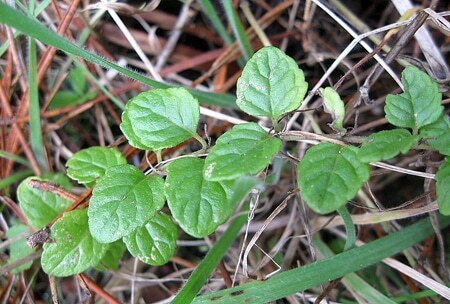 I love yerba buena, which is mellower but similar to spearmint. It was a treat to find it and show Stephanie and Ben what it looks like. Lesson: You never know what you’ll find when foraging, so keep your eyes open. We did finally find some hedgehog mushrooms, which made me feel better about taking them to this spot. 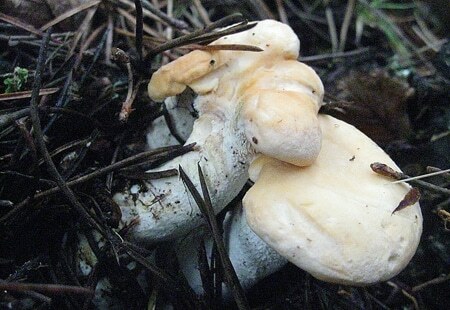 Interestingly, the hedgehogs we found were more ivory than yellow, which is the more common color for this edible ‘shroom. It’s still a little early for hedgehogs in California, so we had to settle for about a half-pound. I’ll go back to the spot in a few weeks to look for more. What makes a hedgehog a hedgehog, Steph asked? Why it’s teeth, I said. Hedgehogs have little teeth, or icicles, hanging from their caps — not gills, and not spongy pores like boletes. 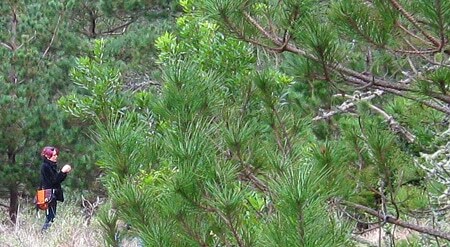 The teeth is a giveaway that you have something in the dentinum family — none of which are poisonous. All afternoon as we walked, I pointed out this mushroom or that one (we also found plenty of mushrooms I could not identify), herbs like California bay laurel, and edible plants such as nettles and curly dock. I don’t know who was having more fun: Steph and Ben learning new things, or me getting the chance to show those things to them. When I left Stephanie and Ben that afternoon I needed to hightail it home to prepare for New Year’s Day, which would begin early, 2:45 a.m., to be exact. Yeah, I know, you were probably still partying then. 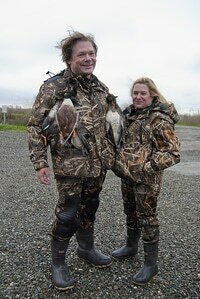 Holly and I had to be up at that hour to get to the Delevan National Wildlife Refuge, where we would meet a couple from San Francisco, Jacqueline and Keith, who had asked us to show them the ropes on their very first duck hunt. Although we’d never met before, both are readers of this space as well as Holly’s blog. I was a little nervous about heading out into the marsh with people I’d never met before and who had never hunted ducks: The chances of us not hitting it off, as well as the potential safety issues (shotguns going off unexpectedly and the like), were very real. Nevertheless, I reckoned that if Keith and Jacqueline were gung-ho enough to spend all that money on waders, jackets, guns, ammo and the like — at least in part inspired by our writing — we could take them out to see what a real duck hunt looked like. I taught myself to hunt ducks, and I floundered around for more than a year before I felt even slightly competent. No sense in forcing others to go through that same trial. On our way up to Maxwell, Holly and I drove through a blizzard. Yes folks, a blizzard. In California’s Central Valley. It’s never happened before in my short time here, and even the old-timers said such a thing is very, very rare. What a day for a first duck hunt! But when we met Jacqueline and Keith they were psyched to brave the elements. A good sign. What size shotgun shells to use? Why do you put the decoys where you do? How do you know which bird is a duck and which one is not when they’re whizzing by you? Which direction should I face? When do you call and when do you stay silent? How do you know which call to use? Will it always be cold? Endless questions. All questions I’d asked myself when I learned how to hunt ducks. All questions I was more than happy to answer. This is how you learn: Either through hard experience, or from those who know, and preferably a mixture of the two. I was grateful to be, finally, in the teacher’s position. As Holly and I began to bring down some ducks, neither of us had any intention of keeping them: They would be our gift to Keith and Jacqueline. We’d been the recipient of so many graciously given ducks over the years I thought I might burst with pride when I finally got to return the favors of all those other hunters who’d helped me. I love what I do. I wake up every day wondering what new interesting thing I will learn, what new rabbit hole I will wander down. Edible mushrooms? Charcuterie? Duck hunting? All are fascinating, absorbing, even thrilling. I am blessed to be able to live this life, and I will never take it for granted — for I know nothing lasts forever. But as wonderful as it is, life would seem selfish and empty if I did not share all this with you. So thank you, Stephanie. Thank you, Jacqueline and Keith. And thank you to everyone who reads this space. You make it all worth it. Happy New Year. Hank you inspire me everyday! Knowing there is someone else out there who appreciates foraging, hunting and the food culture that is so much apart of Appalachian living….makes this Kentucky girl feel a little less obsolete. Thank you for all you do!